Today, Microsoft is announcing new intelligent cloud and intelligent edge capabilities for U.S. government customers. These new capabilities will help government customers uniquely address “the tactical edge”—or, a dependence on information systems and connectivity in harsh scenarios or other situations where users have critical data availability, integrity, and transparency needs. As U.S. government agencies support missions around the world, in remote locations, and beyond the reach of standard infrastructure, new technology is required for mission success. Microsoft offers a comprehensive portfolio designed to bring data analysis and insight to the tactical edge. Azure Stack and our Data Box family of products help government agencies with remote operations access the information they need to make decisions at the edge, along with access to the full range of cloud data analytics as connectivity allows. Just last year we announced the integration of Azure Stack with Azure Government cloud, which unlocks a wide range of hybrid cloud use cases for government customers. By connecting the tactical edge to Azure Government, the mission-critical cloud for U.S. government customers and their partners, federal, state, and local government agencies can now operate with full regulatory compliance and the most up-to-date edge capabilities. 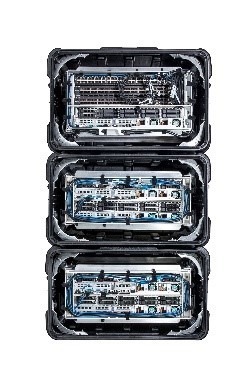 Dell EMC Tactical Microsoft Azure Stack in partnership with Tracewell Systems brings Azure-consistent cloud to operating environments where network connectivity is an issue or mobility and high portability are required, i.e. in remote and rugged circumstances. To learn more, please check out Dell EMC’s announcement. Azure Data Box Edge, an on-premises appliance with AI-enabled edge compute capabilities, is now available in preview in Azure Government. Azure Data Box Gateway, a virtual storage appliance, will be available in Azure Government in March 2019. ​Azure Data Box will be available in Azure Government in March 2019. Azure Data Box Disk and Azure Data Box Heavy will be available in Azure Government in mid-2019. Together, they provide a spectrum of options to move data to Azure Government in secure and simple way. From supporting military and humanitarian missions to the needs of the U.S. State Department or other U.S government organizations, these new systems offer unprecedented opportunities to expedite decision making and bring the power of cloud to areas far beyond the reach of a traditional datacenter. As we have shared, in field operations, speed is of the essence and insights empower decisions. In certain situations, a connection can be a security liability or might not even be available. With Azure Stack, agencies can bring core and advanced cloud services to the edge — right to where they’re needed, making it possible to process data in the field without worrying about latency or even Internet connectivity. See how Azure Stack brings intelligence and cloud services to remote sites here. Being able to gather, discern, and distribute mission data is essential for making critical decisions. Tools that help process and transfer data directly at the edge make this possible. For example, Data Box Edge, with its in-built hardware acceleration for ML inferencing and light footprint, is useful to further the intelligence of forward-operating units or similar mission needs with AI solutions designed for the tactical edge. Data transfer from the field, which is complex and slow, is made seamless with the Data Box family of products. This unites the best of edge and cloud computing to unlock never-before-possible capabilities like synthetic mapping and tracking water or air quality. From submarines to aircraft to remote bases, Azure Stack and Azure Data Box allow for the harnessing of the power of cloud at the edge. By merging the best of commercial innovation and investment with a secure, compliant, truly hybrid cloud platform, agencies can now up-level their infrastructures at a scale, pace, and speed that meets their unique needs. Last year, we announced Azure Stack availability for Azure Government customers. With Azure Stack for Azure Government, agencies can efficiently modernize their on-premises legacy applications that are not ready or a fit for the public cloud due to cyber defense concerns, regulations, or other requirements. These applications can be moved without making any change in code, DevOps tools, processes, or people skills. Solutions like blockchain on Azure Stack enhances transparency and ensure data privacy for various government use cases. Data Box products help agencies to migrate large amounts of data, for example backup, archive or big data analytics, to Azure when they are limited by time, network availability, or costs. Finally, I’d like to share an example of our customer solving a real world challenge using Azure Stack. You can get started with Azure Stack by contacting our solution partners for more details on how to order integrated systems. Or, learn more about Azure Stack by downloading an Azure Stack Development Kit – a single-server deployment designed for trial and proof of concepts. Get started with Azure Data Box Edge preview in Azure Gov by signing up. You can learn more about Data Box family of products at http://azure.com/DataBox.